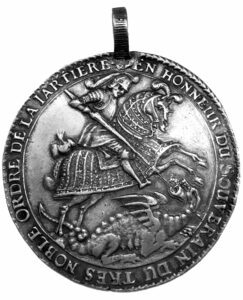 What would a 1671 British knighthood medallion be doing in the dirt near an unexplained, crumbling foundation, within 20 miles of the famous Oak Island, Nova Scotia, money pit? James McQuiston, historian and author, thinks he knows. McQuiston is a fellow with the Society of Antiquaries of Scotland, an honor he received for over three decades of research and writing on Scottish history. Realizing that a living knight from his own Scottish clan holds the title of Premier Knight Baronet of Nova Scotia, McQuiston approached the current searchers on Oak Island, the very people who star in the History Channel hit series Curse of Oak Island. 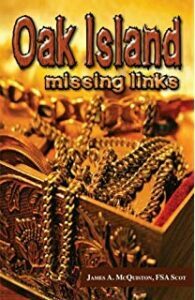 That was over two years ago, and since that day, James has written three books on Oak Island, and has appeared on the Curse of Oak Island TV show, presenting his one-of-a-kind theory. 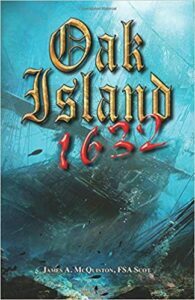 McQuiston has published his third book, Oak Island Knights, revealing nearly all he knows about the situation. In fact, he was adding important information right up until the Saturday before his segment aired, which happened the following Tuesday. While the medallion plays only a small role in his overall theory, it does show an ancient connection of Great Britain to Nova Scotia, and it helps explain away another theory, which McQuiston feels has been misguided right along. Many guesses have been made as to what was or is buried on Oak Island, by whom, and also what purpose the foundation served, which is located about 20 miles up Gold River, at a site called New Ross. Among the theories of who was responsible for the mysteries behind both of these locations, Oak Island and New Ross, have been Vikings and Templars. McQuiston believes the legends begin at a later date, and, more exactly, in 1623. For you see, there are traditions within three groups of people that a “secret estate” was built at the New Ross site for Sir William Alexander, who was given all of the land of Nova Scotia to begin a New Scotland. That was in 1621. By 1623, a ship full of settlers landed on the Atlantic coast of Nova Scotia, not far below the Oak Island and New Ross area. There they unsuccessfully tried to establish a long-term colony. However, the Alexander family, along with a member of the Nauss family of Nova Scotia, and a member of the Mi’kmaq First Nations of Nova Scotia, have all stated that the Alexander estate was built at this site, in 1623. Alongside the foundation is a very nicely built well, which still provides water today, even though no one knows for sure who built it. McQuiston’s theory involves a massive treasure known to have been stolen in Scotland, in 1622. The perpetrators were let off literally “Scot free,” almost certainly with the help of Sir William Alexander. So what does the knighthood medallion have to do with all of this? Well, an alternative theory says that one William Phips, Knight, buried part of a Spanish galleon treasure either at New Ross, or on Oak Island. In McQuiston’s mind, the medallion virtually proves Phips was at the New Ross site, but he believes this future governor of Nova Scotia was there searching for the Alexander treasure, rather than burying one of his own. You see, Phips’ father was named James, but there is no further genealogical information available. Likewise, the private secretary to Sir William Alexander was named James Philp, and no further information is known about him, after his mentor, Sir William Alexander, died, and Philp sold his land in Scotland. This was in the year 1640. The names Phips and Philp are contractions of the name Phillips, and are, at times, used interchangeably. Phips had recovered several million dollars in today’s money from the Concepion Spanish galleon, down in the Caribbean, and returned the bulk of it to King James II, of Great Britain, and to the financier of the venture, Sir Christopher Monck. Monck was so appreciative of the vast treasure that he received through Phips’ efforts, that he gave Phips’ wife a gift worth an estimated quarter of a million dollars, again in today’s money. Certainly, he would have given Phips a token of appreciation. It is McQuiston’s belief that King James II knighted Sir William Phips, despite his ineligibility, and that Sir Christopher Monck gave his Order of the Garter knighthood medallion to Phips, and perhaps encouraged him to go to Nova Scotia to find the Alexander treasure. But is there any evidence? Only three men were knighted in 1671, the date found on the reverse side of the knighthood medallion. The medallions of the first two men were discovered, one in England’s British Museum, and also one once associated with a large Swedish museum. In the Sweden case, the medallion was stolen along with many other artifacts and it is felt that all were melted down for the valuable metals they contained. These medallions were made of silver. The above medallion was found around 1975, and thus predates Nova Scotia law laying claim to most historic or cultural items found after 1980. A letter was presented from the government to the anonymous finder of the medallion, assuring him that his find from so long ago would not be confiscated. The finder cautiously unveiled the 1671 Order of the Garter knighthood medallion in the “war room,” on Oak Island, to McQuiston, as well as to Rick Lagina and Doug Crowell, both driving forces in the current Oak Island search. The photo above was taken by McQuiston, and is most likely the best photo that exists. The third and final man to receive a medallion matching the description of this New Ross medallion was none other than Sir Christopher Monck. The New Ross medallion could have originally belonged to no other man, as only three were minted that year, and two have already been accounted for. Sir William Phips wrote in his daily log that he and his men were searching on land, in the water, and underground for what he called “plunder.” There is no question that the treasure McQuiston feels was buried on Oak Island would be classified as plunder. It is his theory that Phips made it at least as far as New Ross in search of the Alexander treasure, and somehow lost his honorary knighthood medallion at the site. There is a slight compression of the artwork on either side of the medallion indicating that it may have been struck during a battle, or that it was unknowingly dropped, and stepped on. It was found just a few inches under the soil when its owner was playing with his Tonka trucks, as a young lad. 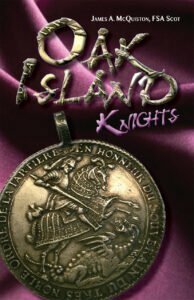 The story weaved in Oak Island Knights stands alongside any classic swashbuckling novel or movie. Perhaps the day will come when McQuiston’s research and story will become one or the other. For now, it is a compelling theory proposed to the Curse of Oak Island folks in the war room, and a non-fiction book filled with quotes from actual 17th century documents, combined with a lot of pragmatic analysis of the known facts. James McQuiston’s other books are available also from amazon. Please click on any image to link straight to view the books. 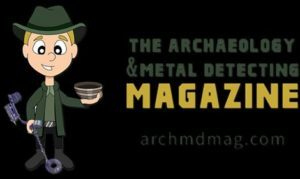 We would like to thank James for his article and other information and look forward to continued discoveries at Oak Island.